Two of the new United States Football League’s teams, the Philadelphia Stars and Denver Gold, made their debut at Denver’s Mile High Stadium on March 6, 1983. The Gold had remained true to the USFL’s original plan of keeping player costs low and lacked high-priced talent on the roster, but Head Coach Red Miller was a popular figure among Denver football fans, having led the NFL Broncos to a Super Bowl appearance. QB Jeff Knapple was out of Northern Colorado and played briefly for the Broncos and RB Bo Matthews had spent eight seasons in the NFL, primarily with San Diego. 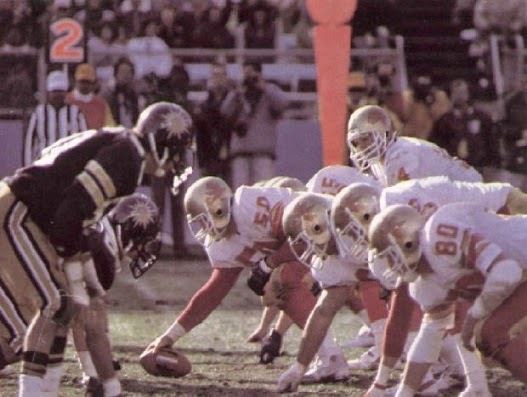 Moreover, the Gold sold more season tickets than any other USFL team coming into the inaugural season, some 33,000, and there were 45,102 enthusiastic fans in attendance for the opening contest. The visiting Stars faced many questions entering their first season. Head Coach Jim Mora, a former assistant coach with New England in the NFL, had only been hired in January after George Perles, originally signed to coach the team, quit to take the head coaching job at Michigan State. The defense had come in for considerable criticism in the media following a disastrous preseason scrimmage against the Tampa Bay Bandits. The biggest name on offense was rookie RB Kelvin Bryant out of North Carolina, while the quarterback was Chuck Fusina (pictured calling signals above), formerly of Penn State and a little-used backup in the NFL. The field at Mile High Stadium had been covered by a tarp and was in good condition while piles of snow ringed the sidelines from a major storm the previous day, but the weather was pleasant for the game. The Gold had the first possession and Jeff Knapple completed two passes to TE Bob Niziolek, but after reaching their own 45, another throw was intercepted by SS Scott Woerner. The teams exchanged punts, with the Stars pinning the Gold inside their 20 and starting their second possession of the game in Denver territory at the 42. The visitors moved methodically down the field and scored on a two-yard bootleg by Chuck Fusina. David Trout added the extra point. Neither team was able to move effectively for the remainder of the opening period, again trading punts. Philadelphia’s maligned defense was particularly effective, utilizing stunts and blitzes to keep Denver’s offense in check (and that hadn’t been utilized in the preseason). In the second quarter, Philadelphia advanced into Denver territory but a 36-yard field goal attempt by Trout was blocked. The Gold were still unable to generate offense and a third-down sack had them punting from their own end zone. The Stars again moved well but a fumble by Kelvin Bryant was recovered by FS Tom Sullivan at the Denver 18. Shortly thereafter, a long pass by Knapple was intercepted by CB Roger Jackson and the Stars advanced effectively, but a botched field goal attempt kept them from potentially adding to their lead with 21 seconds left in the first half. However, on the next play RB Harry Sydney fumbled the ball away after catching a short pass, giving the Stars one last shot in the dwindling seconds. Trout finished off the half with a 50-yard field goal and the score was 10-0 at halftime. The Stars were forced to punt following the first series of the third quarter and the Gold had good field position just inside Philadelphia territory. However, a sack on third down by LB Glenn Howard cost 13 yards and forced Denver to kick the ball away. Another punt was followed by a diving Howard intercepting a Knapple pass at his own 43, but the visitors were again stifled by the tough Denver defense and punted. The next possession for the Gold ended with Knapple fumbling the ball away on a bootleg, giving the Stars the ball at the Denver 34. Philadelphia capitalized when Trout kicked a 29-yard field goal in the last minute of the period and the visitors took a 13-0 lead into the fourth quarter. The home fans booed the ineffective Knapple as he returned to the field for the next Denver series, which ended with yet another turnover, this time an interception by LB Jon Brooks. Following a 47-yard field goal attempt by the Stars that had to be aborted due to a bad snap, the Gold took over with favorable field position and it was Ken Johnson, a veteran with five years of CFL experience, at quarterback. He threaded a pass to WR Vic James on a third-and-15 play to get the ball to the Philadelphia 20 and another throw rifled to Niziolek picked up another 17 yards to the three. Three running plays had the Gold facing fourth-and-inches and Johnson kept the ball himself, running wide for a touchdown to cap the nine-play, 54-yard series. Speelman added the extra point to make it a six-point contest with 6:30 to play. The fired-up Denver defense forced the Stars to punt and the Gold took over at their 35. With the Stars blitzing on every play and the crowd roaring, the Gold advanced into Philadelphia territory on a possession highlighted by a 23-yard carry by Sydney and a Johnson pass to James to get to the nine. Sydney plowed for four yards to the five but, with their backs to the wall and time running out, the Stars stopped two running plays and a lob by Johnson into the end zone on fourth down was beyond FB Larry Canada’s grasp. Philadelphia held on for a 13-7 win. In a game dominated by the defenses, the Stars led in total yards (232 to 215) while Denver had the edge in first downs (15 to 13). However, the Gold turned the ball over six times, to one suffered by Philadelphia. The Stars also were penalized nine times while four flags were thrown on Denver. Chuck Fusina completed 16 of 29 passes for 137 yards and gave up no interceptions while running for Philadelphia’s lone touchdown as part of his 25 yards on 7 rushing attempts. Kelvin Bryant had a modest debut with 51 yards on 18 carries but led the Stars with 6 catches, for 34 yards. WR Scott Fitzkee gained 46 yards on his three pass receptions. For the Gold, Jeff Knapple was successful on 11 of 23 throws for just 70 yards while giving up four interceptions. Ken Johnson was 6 of 10 in relief for 66 yards and had none intercepted. Harry Sydney ran for 50 yards on 9 carries. Larry Canada, in addition to running the ball 7 times for 20 yards, led the team with five pass receptions, for 27 yards, while Vic James gained 38 yards on his two catches and Bob Niziolek accumulated 34 yards on his three receptions. The Philadelphia defense kept doing the job for the remainder of the season, and the offense improved with Bryant as the key performer. The Stars went 15-3 and advanced to the USFL Championship game, where they lost a close contest to the Michigan Panthers. Denver’s defense also continued to play well, but the offense remained a problem and neither Coach Miller nor QB Knapple made it to the end of the season. Miller was fired with the team’s record at 4-7, to be replaced by Craig Morton, the quarterback of the 1977 AFC Champion Broncos. Knapple was waived and picked up by the New Jersey Generals on the way to leading the league by giving up 19 interceptions (while tossing just three TD passes). Denver placed third in the Pacific Division with a 7-11 record but remained popular with the fans and led the USFL in attendance.